German power metallers Paragon are back with their new album (their seventh since 1995), and it may just be their best work yet, picking up right where they left off with the Dark Legacy. Paragon has become a steady band that fans know exactly what to expect when the band releases a new album. Paragon plays German power metal in the vein of Iron Savior, Gamma Ray, and Grave Digger. The band has clearly found it niche, consistently releasing solid albums year after year, without necessarily trying to change their sound, or break new ground in the genre. Just as bands like Running Wild, Accept, and AC/DC have found their style and stuck with it, Paragon seems to have done just that themselves. Of course, this will mean that those of you who insist on originality can almost certainly forget about this release. However, all I ask for is an album’s worth of good music. I understand that not every band can be original (can’t have leaders without followers), but I do need an album to be of high quality. With Revenge, Paragon continue to prove themselves to be on steady force in the power metal genre. The band’s involvement with Piet Sielck of Iron Savior fame helped me to discover and appreciate this band. Again with this album, Paragon includes several Iron Savior-isms in their music. Vocalist Andreas Babuschkin seems to have improved his delivery on this album. I found his vocals to be somewhat unrestrained on past albums, but he really uses his voice effectively on this album. He still has a slight Chris Boltendahl aggressive edge to his voice, but he isn’t over reaching at all on this album. There were a few spots on the album (such as Traitor) where Andreas sounds eerily similar to Piet Sielck behind the mic. 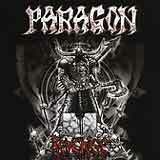 To say that Paragon has a typical German power metal sound is not meant to be a negative remark. Like I said before, originality isn’t the end all, be all of a great album. Sure, Paragon are taking us down a familiar road, but I can assure fans of the band and the genre that this material is outstanding from start to finish. Paragon deliver a no frills, metal wall of sound with this album. The riffs are speedy and in your face, packing a hard punch very much in the vein of Accept and Grave Digger. Certainly, the riffs are the forefront of the sound, everything else falls into place from there. The verse-bridge-chorus song structure dominates the album, not at all a radical departure from the Grave Digger/Iron Savior mold of power metal. As has been the case since the band’s collaboration with Piet Sielck, the big harmony vocals featured in the chorus lines are very similar to Iron Savior. The drum work is tight and speedy, providing a steady, driving backbone for the songs. Wisely enough, Paragon provides some variety on this album. Symphony of Pain is a mid tempo metal romp, while Beyond the Veil is slow song that uses heavy and deliberate riffs instead of speedy drums and a rapid tempo to drive the song home. Empire of the Last is another slower song that features some soloing and riff patterns that lean a bit toward the hard rock genre. The fact that Paragon are able to deliver a quality song without the full throttle speedy means that the able does not become monotonous after several listens. Because of the tight musicianship, and the catchiness of the songs, my attention stayed focused from start to finish. The production is again crystal clear and very tight. Andreas Babuschkin’s aggressive vocals fit just perfectly with the “in your face” guitar work found on this album. As I mentioned before, I think Babuschkin sounds great on this album, really using his voice very effectively. While not even close to an original piece of work, Revenge is undoubtedly am outstanding piece of riff driven power metal. If you like driving riffs, speedy drums, and catchy chorus lines, Revenge will give you a lot to get your neck moving to. If you’ve never heard of this band, I’d recommend that you start with this album and work your way backward. Paragon continue to proudly fly the flag of German Power metal with pride, and Revenge will certainly end up as one of 2005’s shining moments in the power metal genre.